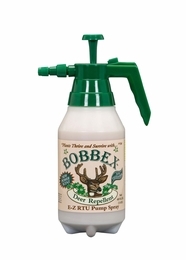 Bobbex Deer Repellent is an original, unique spray made from all natural and recycled ingredients. It is applied directly on the surface of foliage to repel deer. It is readily diluted in water. Bobbex is environmentally compatible and harmless to all wildlife including humans, pets, birds and aquatic life. Same great ready-to-use product in a reusable, easy to use pump sprayer.